I found this to be a fairly interesting book filled with personal stories from the author along with Biblical scripture. Their are 30 chapters, meant to be read over the course of 30 days. The author addresses a variety of issues in this book such as addiction and recovery to forgiveness and learning to move on. I think that everyone can relate to the topics of forgiveness and moving on and I found those chapters to be particularly interesting and helpful. In the back of the book, their is also an index for each chapter containing the Biblical scripture that is referenced in this book. The only thing I found a bit odd was when I was reading the author's biography at the end of the book he is mentioned to be a pastor and a leader of mission trips, but also a performer of stand up comedy in Las Vegas, which I found to be a bit odd. Overall, I enjoyed this book and it touches on a number of topics that most people can relate to. The author's writing is easy to read and combines a variety of different topics in each chapter.Thank you the publisher, Tyndale Momentum for sending me a review copy of this book. * I received a copy from the Publisher for review. This does not affect my review. *This one really hit home for me. Not only did it show me just how much of an affect growing up without a father had on my life, but also how much I need to go to counseling and deal with things I didn't even know I was avoiding. Received a copy from the Publisher for review.Vince Antoucci is a new author to me, but Restore is a book that captured my attention after reading the synopsis of it. It pulled on my heart to read and I must say I was not disappointed. Getting over my past has been a struggle for me and though I say I have given it over to God, I know I haven't done so 100%. This book is all out breaking out of your past and breaking into the future God has for you. It's a motivational book that will help you come out of the feeling of being stuck in life.Vince Antonucci is the pastor of Verve church in Las Vegas. In this book of 30 chapters he teaches how to move past your past, how to heal your hurts and break bad habits. Filled with scripture to give you a Biblical understanding and personal stories to help guide you in a Biblical manner with relate-able examples. He sets this book up as your own personal "rehab" to healing and moving forward with God as your main focus.Though this book is a heavy, it's lightened by Vince's humorous writing. The best way to read this book (in my opinion) is by reading one chapter a day, taking notes, highlighting and allowing the words to really sink into your mind. This is a great book to catapult you into the best God has for you by first letting go hurts, mistakes and regrets. Good read and totally recommend! Where do I begin talking about a book that talks about receiving help and becoming the child of God that no longer lives to sin? I don't feel adequate enough to do so because while I live to the best of my ability to live and enjoy life as God intends for me, I still sin. It's not a willful act for me to just be all, "Yes, I will still sin and do it joyously to receive God's grace." No, that's not me. Paul said this: "We all lived among them at one time in the cravings of our flesh, indulging its desires and thoughts. Like the rest, we were by nature children of wrath" (Ephesians 2:3). Now what I can say about Vince's book Restore is that he does a great job, in my opinion, to address the topics of addiction and recovery. Much more than that he talks about how God can heal the broken heart. I know I may say it on other books I reviewed, but Vince--in a way--comes across as though His heart is simply full of Jesus. If Jesus were in the here and now walking the streets of Vegas doing ministry, He would lead the charge of, "Come and let me make you whole. I am He who scripture declares from the first to the last." I'm not saying Vince is Jesus Christ, but I am saying Vince serves Christ to the best and fullest of his ability (so it seems). If I had to say it differently I would say Vince looks and comes across as a servant with a servant's heart to do Christ's will in his life. There, I simplified that. With Vince's way about things and in his own personal way, he comes across as being more than personal and touching. He also comes across as being sincere in wanting to show there's another way to live life. One that is fulfilled and made new; one that is joy-filled and restored by the hand of God.For me, as I read the book, I was trying to keep in mind not everyone is "put together." In some way most of us are broken. We don't see it or want to admit we are. We hide it: in a bottle, in meaningless relationships, in online pursuits, in drugs, or through watching too much television. But if we want to be set free from those old bonds, to no longer be enslaved by those things, it means something radical has to take place. Shame needs to be cast off and we can't simply do that on our own. Christ came to break the bonds of sin and death. He came as the master over sin and death, and He shows us by His willingness to die on the cross that only He could defeat them. With all of that said, what I can say about Vince's book is that if you allow God to invade your heart, to invade your mind, to do that radical life-changing restoration only God can, you will be changed. It means taking Christ as Lord and Savior. It means your faith has been changed from the things of this world, to the Son of God who takes away our sins. So, if you choose to read Vince's book Restore, come with an open mind about God being able to change you from the inside out. I received this book compliments of Tyndale in giving an honest review. All opinions are mine. ***DISCLAIMER***I received a complimentary copy of this book for free from Tyndale House for review purposes.Vince Antonucci pastors an "innovative church" called Verve in Las Vegas, Nevada (p. 291). 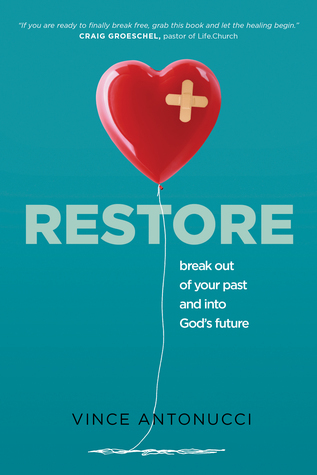 His book Restore is about the “journey to a restored life” (p. 9). He claims that God does the restoration for the individual but “we have a part to play” (p. 3). This borderline (if not definite) synergistic teaching seemingly makes God work on a quid-pro-quo level (which is contrary to what the Scriptures say since salvation is a gift, per Romans 6:23 and Ephesians 2:8-9, among others). He organizes the book into six “steps” (essentially a section, each step supposedly leading to “freedom”), spanning thirty chapters (called “days” in this book). He claims that "Reading and really engaging in this book is going to cost you something" (p. 46). I find that interesting because aside from the time it took to read the book, it did not really cost me anything. Maybe the "time" is what he meant by that.As for my opinion of the book, I would not recommend it to anyone. At the book’s ending, in a section titled “About the Author”, it notes how Antonucci does stand-up comedy in Las Vegas. Instead of pastoring a church (which is what he does for Verve in Las Vegas, Nevada), he should stick to the comedy. While I certainly do not oppose a sense of humor, his humor bleeds everywhere in this book, making it hard to take him seriously even when he is discussing serious matters in both his own life and life itself. Other things that run rampant in this book include but are not limited to New-Age terminology (inexcusable since he is a Christian pastor), a minimization of sin (he often, but not always, refers to it as the “past” or a "mess", which is both vague and not entirely accurate), narcigesis (reading yourself into the biblical text), false teaching (the aforementioned synergism and his false concept of what Christianity really is; see page 66 for the latter) and logical fallacies (such as “tu quoque”; see day 4 in pages 37-43). If I am a Christian that wants to learn more about God’s Word and what true, accurate restoration is based on what the Scriptures say, I will not look to Vince Antonucci’s Restore. I may look to him for comedic relief, but I would definitely not look to him for anything of a theological nature. Aside from research purposes, stay away from this book. This was a book of pure curiosity for me. I am not dealing with a bad, haunting past creating bitterness in my present day life OR a present day addiction - both situations for which the book was written. Throughout the book, author Vince Antonucci, a pastor in Las Vegas, shares his wrecked childhood and adult bitterness due to an abusive father whom he struggled to forgive. It could be called an addiction to unforgiveness. As a matter of fact, the book is really written for people struggling with an addiction. As the author shares his Christian experience, wisdom, and insights on how the equation “God + rehab = RESTORATION”, he does so in an easy to read and digestible 30-day style - one reading per day. Obviously, you can read at your own pace, which is how I made my way through the book. I found the organization of the book helpful in its 30-day readings, six “Steps to Freedom” groupings of readings, Moving Forward, and untitled appendix section that includes a discussion guide.The author lightens up this serious issue of addiction with plenty of doses of humor—from his own humor interspersed throughout the text to the occasional Top Ten List (11 in all), on topics such as: self-help books, signs you should be reading another book, and signs your inner child is upset. This feature adds to the book’s ability to help all who struggle with out-of-control behavior.As a final encouragement, don’t miss Vince’s “Letter I Wrote about Me, to Me, from God” in the appendix section. The author was directed to write his letter as part of a sexual addiction program he took NOT to deal with any sexual addiction but to deal with forgiving his father! It is a surprising twist in the author’s personal story but effective in assisting him on his forgiveness journey. Vince Antonucci is like a breath of fresh air. His new book hits the hard topic of addiction and recovery but he broaches the topic with a way that everyone can relate to. Are you an addict? Of course we aren't! Are you sure? Do we turn to "things", "people", "chocolate", or "shopping" to ease our stress or to feel more joy in our lives? Do we buy one outfit and feel good, so we think if we buy two we will feel even better? Do we come home and binge watch our favourite tv show to numb the pain of the day? That my friend is an addiction. I will let Vince explain the rest. He keeps it real folks! He will tell you about his family, his dog and his life. He will tell you stories from the Bible in a way you can understand and relate to. He combines our daily habits, our stress and our joys and explains how whether it's a good day or a bad day there is only one way to go. One person to turn to. That's right....God! Seems so simple doesn't it? Yet why can't we do it? Vince will walk you through the steps, help you discover a new relationship with God. I thoroughly enjoyed this book. It's one that I think everyone can relate to. I felt a kinship with Vince. It's like he can see into our everyday struggles and joyous moments and can explain how and why we feel the way we do. A brilliantly written book that I highly recommend. I was so graciously gifted this book by Tyndale House publishers for my honest review. The stories within this book goes straight to the core of your heart. There is a piece of me in all of them. The explanation of insanity made me have a hallelujah moment. I mean why do we do something over and over, expecting something different to happen...yet we walk away feeling more and more empty inside? Only to get up the next day to do it all over again! I love the Top 10 lists he's added throughout the book and the extras in the back. The Notes are terrific because it gives verses and the exact location in the book it's referring to. But, my favorite is the discussion questions to use along with each of the 6 Steps. This would be a great book to read if you struggle with any form of addiction or have a loved one who does. I have highly recommended this book to our Celebrate Recovery group at our church. This book would also help someone who has been hurt, who is struggling with letting go. I plan to reread this book with my Hubby, because every day is a new day to make healthy decisions and we just can't do that alone without each other and God.Tyndale House Publishers has provided this book to me in exchange for this Review. I was intrigued to read this book and it looked really good, in many ways it met the expectations I had for it but in other ways it fell rather flat. Some of the authors points were right on while others were a bit out there. I felt like the author had some good personal experience and experiences of others but some of his points felt off. The writing at times felt a bit choppy and didn't always flow very well but I liked some of his steps for being restored, he had some excellent points that were encouraging and well thought out.I received a copy of this book in exchange for my honest opinion. I received a complimentary copy.Q&A-- What did you like about the book and why? The author chose to create a feeling within God that helps the readers to get a little less stuck in the moments of life.- What did you not like about the book and why? Not everyone will abide by or agree with the tips and facts, but it depends on belief. - What did you learn? You can break free even it it hurts and know that God is with you. - To whom would you recommend this book and why? Someone trying to get over an addiction or feeling of being locked in to life instead of living it. This book is about breaking bad habits (sins), dealing with part hurts, etc. The author talks about going to rehab to help him heal in forgiving his father for his difficult childhood. The lessons taught in the book apply to those who have problem areas they need to resolve in Christ to move forward in their lives and faith. The author is comedic. It is a way to lighten what could be a very tough subject. Overall I thought this was a good book.I received a free copy of the book from Goodreads but my opinions are my own. This book is defiantly a book that many people may like and others may not, the points in this book seemed a little to extremely off for me and I don’t think that people who aren’t religious are going to pick it up even if it is to try and branch out of their normal reading zone. The writing wasn’t the best yet wasn’t the worst I’ve read yet. A great book for building better habits and relationship with Jesus. Vince Antonucci - Vince Antonucci pastors Verve, an innovative church that seeks to reach people who work on and live around the Las Vegas Strip. The upcoming upcoming television series God for the Rest of Us will chronicle Vince's work there. In addition to writing books, Vince leads mission trips around the world, speaks nationwide, performs stand-up comedy in Las Vegas, and most of all, loves spending time with his wife, Jennifer, and their two kids.